Nature never fails to surprise us. In many parts of the world, natural resources are the only source of livelihood opportunities available to people. They can be in the form of wild shrubs like Daphne papyracea and Daphne bholua (paper plant) that are used to make paper or Gossypium spp (cotton) that forms the backbone of the textile industry. Nothing can compete with the dynamism of biological resources. Recently, Girardinia diversifolia (Himalayan nettle), a fibre-yielding plant, has become an important livelihood option for people living in the remote mountainous villages of the Hindu Kush Himalaya. There is a community in Khar, a hamlet in Darchula district in far-western Nepal, which produces fabrics from Himalayan nettle. The fabric and the things made from it are sold in local as well as national and international markets as high-end products. A Himalayan nettle value chain development initiative implemented by the Kailash Sacred Landscape Conservation and Development Initiative at the International Center for Integrated Mountain Development has transformed the lives of the people in Khar. This is true, especially for women and marginalised groups. With help from the project, they have come to recognise a nature-based sustainable alternative income source and use it for their benefits. The residents of Khar have incorporated sustainable harvesting and processing techniques in their Himalayan nettle production chain. Today, Khar is on its way to become a nettle fibre production hub. Mufflers, stoles, suits and other items of clothing, purses and bags are some of the things people in Khar produce. These products have been exhibited at national and international trade fairs and are considered an excellent souvenir option. At the 5th International Herbal Trade Fair held in Bhopal, Madhya Pradesh, nettle products from Khar caught the attention of some of the state’s highest dignitaries as well as locals and tourists. Locals were mesmerised by the idea of producing valuable fabric with something that grows abundantly in local surroundings. They were keen on learning about nettle processing and applying the same technique to yield fabric from the Himalayan nettle, locally pronounced as “bicchoo ghas” in their area. In a way, the otherwise unnoticed, remote mountain community of Khar has been able to establish its identity through the use of biological resources. Perhaps, in the near future, people will come to visit Darchula to learn more about the place and its people. Apart from nettle production, tourism presents one of the highest potentials for income generation in Darchula. Sustainable community-based tourism, with focus on adventure and culture, needs to be promoted in the district. 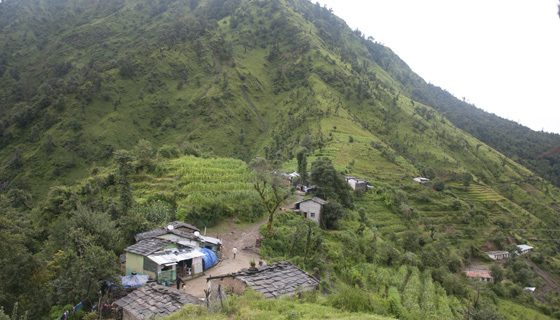 Darchula also forms a part of a newly established Api Nampa Conservation Area of Nepal. The landscape is rich in biodiversity and offers numerous opportunities for various activities like trekking, rafting and mountaineering. However, owing to its remoteness and unfamiliarity, the landscape at present does not attract many tourists. On the other hand, the area’s remoteness has conserved its authenticity, thus increasing its value and attraction as a possible tourist site. There is a lot of potential to be fulfilled here. Also, important in this regard, is the fact that Darchula district in Nepal and Dharchula in Pithoragarh district in Uttarakhand together form a gateway to the sacred Mount Kailash and Lake Mansarovar (also a Ramsar Wetland Site) in the Tibet Autonomous Region of China. Thousands of people visit these pilgrimage sites from around the world. Often, devotees visit these districts to get the feel of the sacred landscape, the Kailash Dham. And for someone like me, the thought of crossing a bridge over to step into another country is quite exciting. 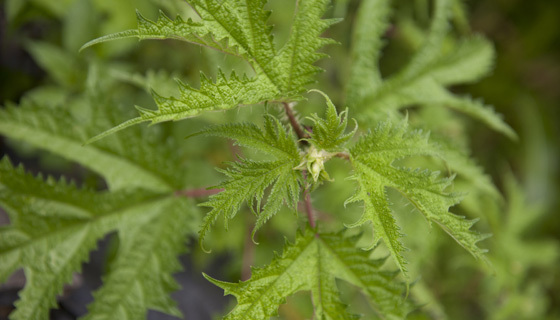 For tourists, purchasing nettle products from the source itself is a fascinating idea. Natural attractions like the Om Parvat, Adi Kailash, Jauljibi (confluence of the Kali and Gori rivers), Mount Api (7,132 metres) and Mount Nampa (6,757 metres) are invaluable in attracting tourists on both sides of the Nepal-India border. This interesting relationship between biodiversity and tourism is something to think about. 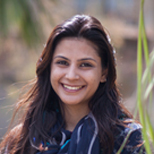 How many of our readers knew about Khar before? I wrote about Khar because the community there has been able to work successfully with Himalayan nettle. Most of you know Darchula as a remote district in Nepal and relate it with beautiful mountains like Api and Nampa. People think of Kali and Gori rivers when they hear about Pithoragarh. All these places boast of the Earth’s natural wealth, its biodiversity. On the occasion of the International Day of Biodiversity, we should celebrate our identity—a recognition bestowed on us by Nature.